Toshiba back with 4K HDR OLED and Alexa-enabled TVs | What Hi-Fi? It’s been a whirlwind year for Toshiba. Following a spot of financial trouble, in which the company posted a £3.8bn loss, the TV brand announced its partnership with Vestel at IFA 2016, and returned to the European TV scene. 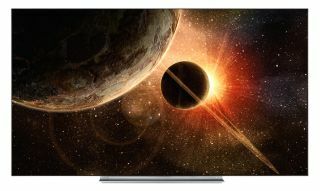 Earlier this summer Toshiba announced its first 4K OLED – the 65in X97 – alongside lower U77 and U67 ranges of 4K LCD televisions offering smaller size screens – a good start if the company is looking to be the greatest comeback story since George Forman. And, it seems, things are still looking up. Toshiba has announced three new 4K sets that support the two most prevalent HDR formats: HDR10 and Dolby Vision. They are also future-proofed to support Hybrid Log Gamma when the broadcast HDR format finally gains momentum. An Ultra HD Blu-ray player - or any 4K HDMI source – can connect to any of the sets’ four (2.0-compatible) HDMI inputs, and 4K content on Netflix and YouTube can also be accessed via the TVs’ smart portal. There’s no word on its inclusion of Amazon Prime Video, but we hope it's being considered. MORE: HDR10 vs Dolby Vision: this is better? The good news continues; Toshiba has also announced its collaboration with Amazon for a range of Alexa-enabled TVs. Having Amazon's voice-activated personal assistant onboard will allow owners of an Amazon Echo or Echo Dot wireless speaker to control the supported TVs – power it on/off, select channels and inputs, and adjust volume, for example – with the sound of their voice. The TV simply has to be connected to the same network as the Amazon speakers, and set-up to Alexa via the Alexa app. Details on the models fortunate to have this feature are scarce, although the range will offer screen sizes between 43in and 75in. Supposedly, an Alexa-supporting 43in 4K TV will carry a seemingly reasonable €400 price tag. We also know the (fairly more considerable) damage of the 55in OLED: €1699. Apparently leaving no stone unturned, Toshiba is also introducing a "card-thin Wall Art TV" design concept in a 65in 4K- and HDR-compatible model, which is designed to hang on - and sit flush against - a wall. Smart. The new range of TVs should be available later this year, but rest assured we’ll be bringing you further updates on pricing, availability and screen sizes as soon as we have them.